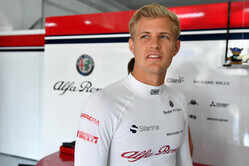 Schmidt Peterson Motorsports has announced Marcus Ericsson will drive the team's No. 7 Honda in the 2019 IndyCar Series season. Currently driving for Sauber, 28-year-old Ericsson will make the move to IndyCar at the conclusion of the 2018 F1 season. Thus far, Ericsson has made 95 F1 starts, his best finish being eighth in the 2015 Australian Grand Prix. He finished ninth on Sunday in the Mexican Grand Prix. "It's a great honour to be picked as one of the drivers at Schmidt Peterson Motorsports and IndyCar for the 2019 season," said Ericsson. "It feels like a perfect step for me and my career after five years in F1. I can't wait to start work with SPM and all the people in the team, which I've heard a lot of good things about. They've had some great success over the years, and I'm looking forward to work hard to continue and improve on that path. "The racing in IndyCar looks great and I feel really excited to be part of it in the future," he continued. "It will be a lot to learn, including new tracks, oval racing, etc. I know it won't be easy, but it's a challenge I'm very much looking forward to and I can't wait to get started." Ericsson will team with veteran James Hinchcliffe, who enters his ninth IndyCar season overall and fifth with Schmidt Peterson Motorsports in 2019. Hinchcliffe will continue driving the No. 5 Arrow Electronics Honda. The No. 6 Schmidt Peterson Motorsports Honda remains open for injured driver Robert Wickens, this year's Sunoco Rookie of the Year for both the Indianapolis 500 and the season, when he wants and is able to return. "Ric Peterson and I are excited to welcome Marcus to the team," said SPM co-owner Sam Schmidt. "He has a ton of experience racing in the top levels of motorsports, so we believe that he will be able to contribute to our development program that began in earnest in 2018. "While the circuits on the INDYCAR schedule will be brand new to him, particularly the ovals, we have a lot of confidence and trust in his eagerness to learn along with his work ethic. We think he and James will be a good fit to push one another and fight for those wins." With Charles Leclerc heading to Ferrari, Sauber opted to sign Kimi Raikkonen and Antonio Giovinazzi for 2019, and while Ericsson was expected to remain as reserve and development driver, the Swede clearly had other ideas. "Looking forward to seeing him at Long Beach!" "Interersting to see a post race interview where he airs his frustrations about beeing kept out to hinder other people to get to Charles. And mere days later he is confirmed for a new race seat. That must have felt good for him to finally get it off his chest. I wonder how many other times he has been sacrificed by the team, and still not make a squeak about it to the press. (His work/team ethic seems to be very highly regarded, not like other drivers always blaming brakes, engines etc.)"